Here’s something you don’t see very often around here: a knitted garment! It’s also something else that you don’t see here very often: a made-by-me garment that I hate! Things went wrong with this sweater from the very beginning. You see, I made the rookie mistake of choosing a pattern because I thought the stitch pattern was really pretty without even considering the fact that this isn’t a style that I like to wear. I don’t like cardigans and I really don’t like fitted sweaters. But when I started knitting this nearly 2.5 years ago (! ), I didn’t have as firm of a grasp on my personal style and couldn’t have articulated exactly what I like to wear. That may sound funny, but it’s only very recently that I’ve really felt like I dress the way I like to. I’ve always hated shopping, have lived in big cities since I was 18 where shopping is chaotic and unpleasant, and was always on a tight budget, so I sort of grabbed whatever was cheap and quick instead of thinking about what I feel good wearing. Silly, I know! 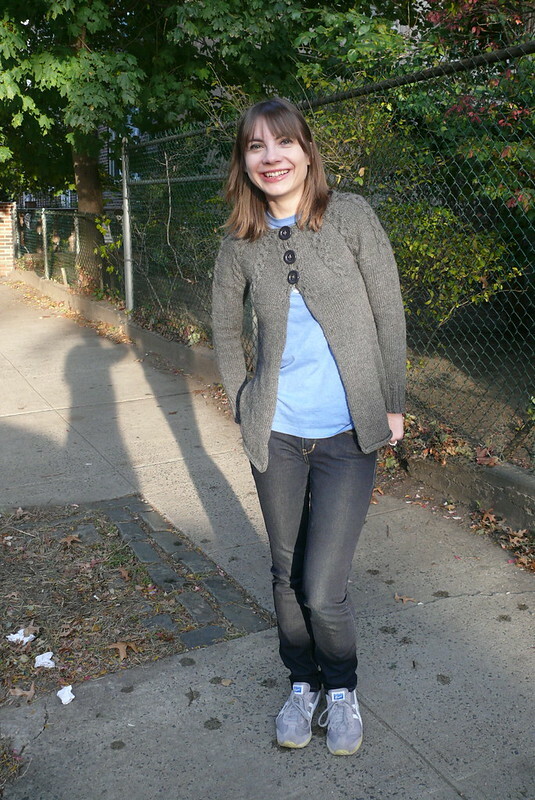 The pattern is the Honey Cardigan by Veera Valimaki (Ravelry link here). When I first began knitting, I was really attracted to Veera’s designs. They are lovely, modern designs that are fun to knit and always look so cool. My original plan was to make this in a great gold color, so I bought Quince & Co. Lark in “honey”. But when I swatched for the sweater, I didn’t like how the fabric looked when I knit to gauge, so I discarded that plan (the yarn eventually turned into my Bough hat and Guernsey wrap, so it didn’t go to waste, luckily). 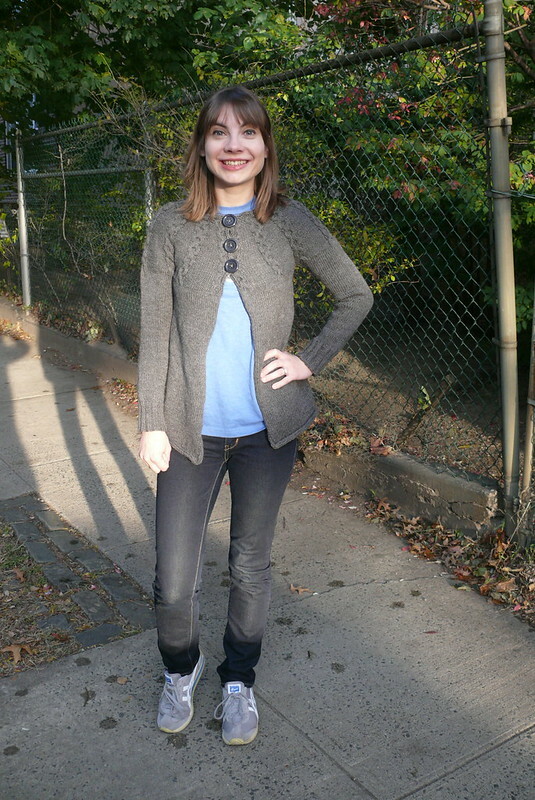 I had enough Cascade 220 in “charcoal” to make the sweater (according to Ravelry, I bought this yarn in 2010, yikes! ), so I cast on in that, finished all but one sleeve, and then let it sit for two years. After finishing my Ginger jeans, I started to feel guilty about my stack of unfinished projects, so I pulled out this sweater and decided to finish it. I didn’t like the way the first sleeve looked, so I unraveled it and started over, following the instructions for the sleeve from the Effortless cardigan (here’s my finished sweater). I’d felt that the sleeves were a little short when I made that sweater, so I lengthened them by 1″, but they still feel too short. At the end of the day, I’m just not into this sweater. I love the way the cables pop out of the reverse stockinette, but otherwise I’m just not feeling it! I don’t like the way the i-cord edging looks, although I suspect I may have screwed it up as it rolls under on the center front edges and out on the hem edges (huh?). And I don’t like that it only buttons at the top. And I don’t like how tight it is at the upper chest. And I really, really don’t like that I had to use such huge buttons. The buttonholes are made by knitting unattached i-cord, and then reattaching, so it forms loops. Buttons that look proportional slip through the loops, even with a substantial yarn shank, so I dug these huge buttons out of my stash (pretty sure I cut them off my thoroughly-trashed peacoat after it bit the dust), and I think they look crafty and cheap. Yuck! This isn’t a failure of the pattern or even of the (admittedly boring) yarn… I just totally failed to think this through before starting in on it. 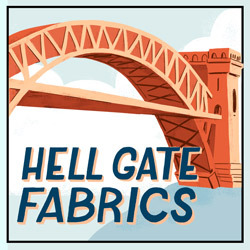 Luckily, I’ve gotten much better about understanding what I like when it comes to sewing, so I very, very rarely have finished garments that I don’t like. Hopefully I’ll get a little bit smarter about choosing the right knitting projects in the future! But at least I finished this and got it out of my UFO pile, and it will be finding a new home with my mom or sister soon! Alright, guys, ‘fess up. What was the last thing you made that you don’t really like? Have you ever been silly enough to make something that’s not your style at all? « Book Report + Giveaway: Fabric For Fashion… The Swatch Book!!!!! It’s a great pattern – I guess it would be tricky to make into jumper? I can see you in that more. Perhaps sew it together and a feature trim down the middle? Too bad the sweater doesn’t work for you. I think it’s nice. I’m sure you will find a happy home for it. When I saw the picture of the post I was wondering wether you changed your style.. It is a beautiful knit, shame you won’t be wearing it, but hopefully will make someone happy at Christmas! Good on you to have finished it!